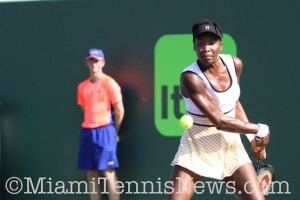 Seven time major winner Venus Williams ushered out world number four Caroline Wozniacki 6-3, 7-6 in the round of 16 at the Miami Open to punch her ticket into the quarterfinals for the first time since 2012. 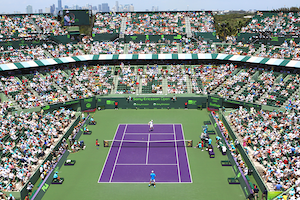 The players could not maintain serve until the sixth game when Williams held for 4-3. Subsequent to a couple of long games, Wozniacki once again faltered. Venus broke to wrap up the opening set. In the second set, Wozniacki threw the gauntlet with a break for 3-2. Although Williams found the equalizer promptly, as the serve deserted her, she was broken once more. In spite of difficulties, Wozniacki consolidated for 5-4. With the Dane serving for the set, Williams crushed a forehand up the line for triple break point. Soon, score was knotted at 5 a piece. But, ahead 40-0, Williams had three consecutive double faults and eventually gifted another opportunity to her rival to push the match to a third set. Quickly, the American bounced back with triple break point and capitalized to bring up a tiebreaker. With a nearly pristine performance, Williams claimed the tiebreaker 7-1. The American preserves her spotless record against Wozniacki and is now 7-0.